Today's Daily Deal! 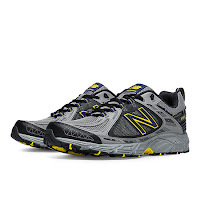 Save 43% on the Men's Running 510 Now Only $39.99 + Free Shipping at JoesNewBalanceOutlet.com! Change up your run without changing your shoes and don't miss a single beat of your workout in the 510v2. This versatile trail running shoe for men combines the off-road outsole you need for the trail with a full-length cushioned midsole that provides the comfort of a traditional road running shoe. You can run from trail to road and back to trail again without stopping.